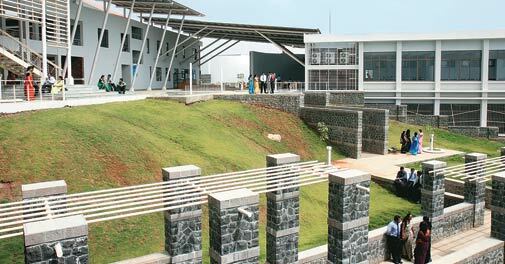 Arvind Narasimhan, an engineering graduate who worked at Evalueserve, a knowledge process outsourcing company, decided in 2007 to go back to school. He took several MBA entrance exams and aced a few. Several highly sought-after schools were interested in his application, including Jamshedpur's XLRI School of Business and Human Resources, Faculty of Management Studies (FMS) in Delhi, and Narsee Monjee Institute of Management Studies, Mumbai. 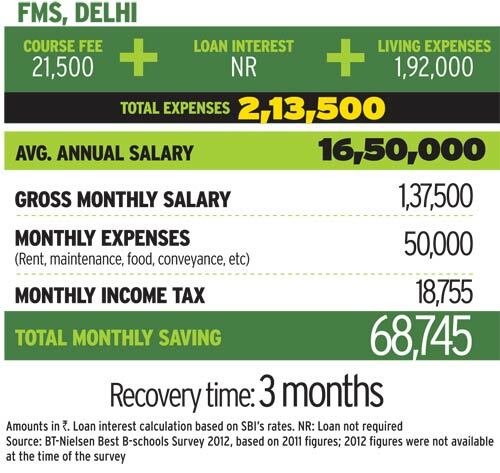 "The two-year tuition fees for XLRI were around Rs 6.5 lakh, compared to Rs 20,000 for FMS," says Narasimhan. He took a loan of Rs 1.5 lakh, which would cover fees, contribution to the student association fund, accommodation, books and other expenses. "In two months, the loan was over," says Narasimhan. 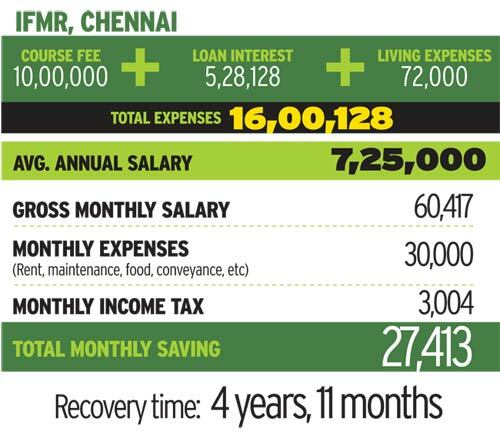 "Had I studied at XLRI, it would have taken three years to repay Rs 6.5 lakh. I would end up paying some Rs 10 lakh as principal and interest." "Our basic tuition fees have hardly changed since the 1970s," says M.L. Singla, professor at the no-frills institute, housed in the University of Delhi's North Campus. 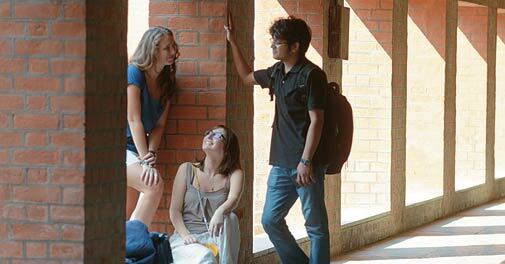 "Being part of Delhi University, we are funded by the University Grants Commission. That's why the fees are highly subsidised." He adds that FMS does a good job of keeping costs under control. "We don't have lavish infrastructure like others. We share infrastructure with other university departments. With the least resources, we are able to produce equally good MBAs." 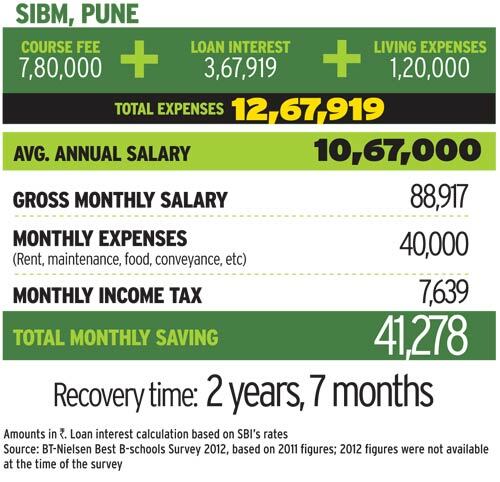 Shawn Francis, who topped the 2012 batch of the two-year finance programme at Symbiosis Institute of Business Management, Pune, says the payback period varies significantly even within a class. Now a credit analyst with a global financial services company in Mumbai, he says the slow economy meant that some of his classmates had trouble finding jobs. "They had to settle for lower salaries," he says. "They may recover costs over a longer period." Francis spent Rs 10 lakh on the two-year programme, though he wanted to join the oneyear course. A computer engineering graduate of the University of Mumbai's class of 2009, he did not have the minimum work experience required for many one-year courses. 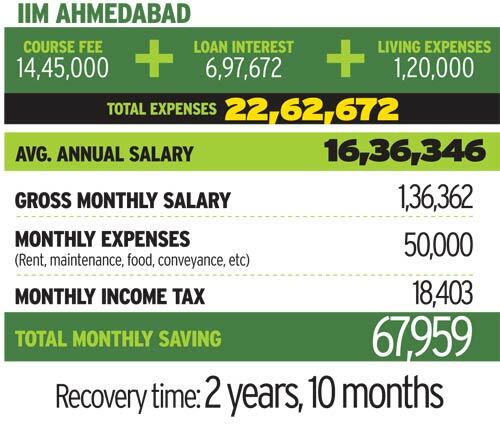 But he has no regrets: his job lets him save Rs 45,000 a month. He began working in April 2012, and expects to break even by January 2014. Prashant Bhonsle, Country Head of Credila Financial Services, the education loan unit of HDFC, says the number of people seeking loans for an MBA has risen sharply in the past three years. "Earlier, students would self-finance education expenses, because the fees were lower," he says. "Around 60 per cent of students take loans now." Bhonsle says the return on investment in an MBA is highly skewed in favour of Tier I and Tier II schools. "Top-league institutes have a proportionate rise in salaries and fees," he says. "In low-rung institutes, fees have risen, but salaries have largely remained stagnant, so the returns are not commensurate with the cost." Shipra Sharma, marketing director at Tattva Spa in Gurgaon, near Delhi, says she is lucky she graduated from IIM Lucknow in 2007. Her two-year course cost a total of Rs 3.5 lakh. 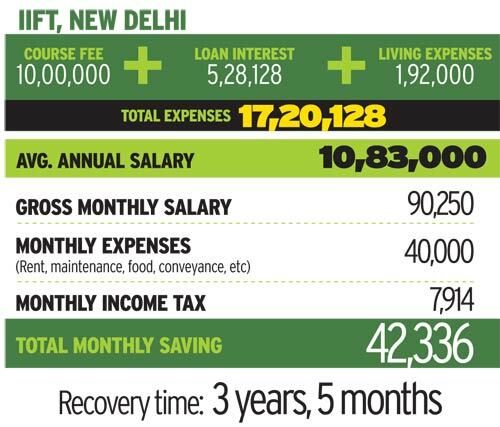 Compare that with the Rs 12.15 lakh that the class of 2014 is paying. She says she borrowed against her parents' wishes, because she didn't want to burden them. "I took a loan of Rs 3 lakh at nine per cent. 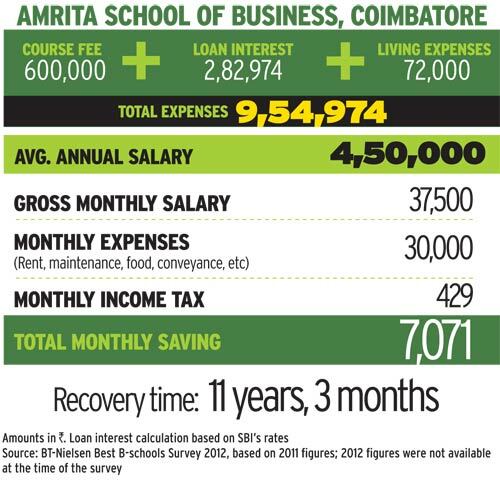 For other B-schools, the interest rate was around 12 per cent." Sharma, who had an engineering degree, had been offered a job by a European company before she went to IIM Lucknow. "They were paying me around Rs 5 lakh a year," she says. "My parents were keen that I take up that job and get settled. I had made up my mind. I wanted to pursue a management degree at a good institute, because the engineering college wasn't a big brand." The payback period increases for institutes at the bottom of the heap. In Tier III institutes, where the average annual salary is less than Rs 8 lakh, the payback period is five to 12 years for students who borrow from banks. In Tier I institutes (average salary above Rs 15 lakh), it is one to three years. T. Muralidharan, Chairman of TMI Group, a human resources services company, says return on investment hinges on a graduate's first job. He says sectors such as consulting and investment banking offer better starting salaries than manufacturing.